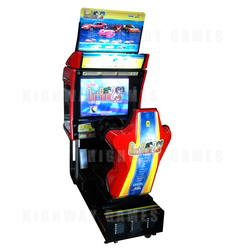 Outrun 2 Arcade Machine is a driving/racing game in which players go head-to-head as they cruise around in a Ferrari sports car with a young lady (only in 5 stages). The players will race through 15 stages and the player can choose their course and the soundtrack. OutRun 2 takes this basic concept and expands on it. As well as the Testarossa of the original, seven other Ferraris are drivable, thanks to an official Ferrari license. Each car has different handling characteristics, but the eight cars are sorted into four groups based on difficulty — novice, expert, a lower intermediate group of cars with better handling and higher top speed, and a higher intermediate group of cars with better acceleration. OutRun 2 provides three single-player game modes: Outrun Mode, Heart Attack Mode, and Time Attack Mode. Outrun Mode is basically the rules of the original OutRun game — the player drives through 5 of 15 stages, selecting them en route. As before, there is a time limit which is extended when the player passes checkpoints. Heart Attack Mode is Outrun Mode with a twist. As well as driving the open-ended course to the time limit, the passenger will frequently request certain stunts and actions. These requests, carried out through marked sections of the course, can include passing cars, drifting around bends, driving through marked lanes, knocking over cones, and simply not crashing into anything for as long as possible. If successfully done, the player will receive hearts and, at the end of the request section, will be graded on their performance. The player's performance is also graded at the end of the stage. Crashing into the scenery at any time will result in the player losing hearts. Should the player reach a goal with a satisfying grade, a more romantic ending is displayed. Time Attack Mode has the player race a 'ghost' car over a pre-selected course to the time limit. Time checks are presented to the player at various points on each stage.